EXT (short for Extended File System) is a Linux filesystem. First EXT version was implemented in 1992. EXT is widely used both in ready-made NAS devices and with DIY RAIDs. NAS vendors and home users often choose EXT filesystem because of its reliability and stability. EXT filesystem family is divided into three groups - EXT2, EXT3, and EXT4. md-raid or LVM metadata failure. In any of these failures, ReclaiMe can read EXT filesystem given that you launch the software on Windows. Download and install ReclaiMe File Recovery. Launch the software and select EXT device. If your recover data from a NAS, the needed volume will be displayed under Linux MD RAID or Linux LVM sections. Wait until the software completes the analysis. Usually, you need to wait till 3-4%. 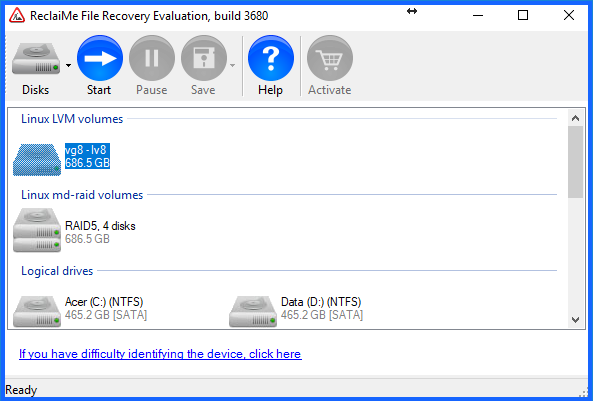 Check the files and folders and if you are satisfied with the EXT recovery result you can start to copy data. If you do not see the volume you need in the device list of ReclaiMe or you are not satisfied with the recovery result, most likely md-raid or LVM metadata is severely damaged. In this case first you need to restore RAID configuration parameters using another software – ReclaiMe Free RAID Recovery and only then you can proceed with data recovery. There are two notably different failure modes – total catastrophic filesystem failure, like formatting or superblock damage, and accidental file deletion. While total failure is often recoverable, very limited recovery of deleted files can be achieved. As already mentioned, there are three types of EXT filesystem – EXT2, EXT3, and EXT4. EXT2 was fairly easy and even undelete quality was typically good, but, unfortunately, EXT2 is not used in modern devices. On EXT3 or EXT4, deleted file recovery quality is typically worse. You don't get any file names, and you only get files with known headers (detected by raw scan, also called file carving). If we compare EXT3 with EXT4, then EXT4 is usually recovered better than EXT3, since file fragmentation on EXT3 is more intense than on EXT4.